Why, you may ask, am I posting the next Hay Hay it’s Donna Day! challenge so soon after winning the last round? Why am I not savoring the moment and kicking back with a glass of wine to celebrate? Why am I already spending hours (not really) in the kitchen working on the new challenge? Not being one for secrets I will tell you that it’s because I miss the ‘relax’ gene, I’ve never been good at kicking, wine in Thailand is stupidly expensive, and we’re spending most of March traveling to northern Vietnam and Thailand’s Andaman coast (jealous?). So Barbara and I decided to do it sooner rather than later. Because for me, later never happens. So here it is, your next challenge for this event that was created by the innovative and very sweet Barbara, inspired by the (as I am discovering) great Donna Hay and previously hosted by my funky Southeast Asian neighbor Joey; Coconut Chocolate Tarts from Donna’s book New Food Fast. It is a very-very-extremely simple recipe. And the ingredients are very basic and easy to get your hands on as well. Preparation time should not be too long, the thing that takes the most time is for the chocolate to set, but more about that later. The reason I chose such an easy recipe is because with simplicity, in this case, comes endless possibilities. Endless. So what I’m giving you is the opportunity to let your inner culinary artist go nuts! Let me explain the recipe. Mix the egg whites, coconut and sugar well. Scoop the mixture into muffin tins and with wetted hands (works best this way) press it out to create a base and sides for a cup. Put into the oven at bake for about 8-10 minutes, or until it begins to lightly brown. Remove from the oven and let cool for one minute. Gently remove the cups from muffin tins and let it cool more. While this is happening, heat the cream in a saucepan until almost boiling. Remove from heat and throw in the chopped chocolate. Stir until the chocolate has melted into the cream and you have a decadent and rich looking chocolate liquid. Carefully, fill each cup with the liquid. Put the cups on a plate or tray in the freezer and leave it for 10 minutes or until set. When set, remove from the freezer and serve to guests with coffee or as a dessert. You’ll be an instant hit. Or be selfish and enjoy it all yourself, I know I would! – Although you should use muffin tins, I used paper cupcake forms and went through the whole process and only removed the paper after the chocolate has set. – Mine took longer than ten minutes to set, but I think my freezer is not that cold. – If you follow this recipe, you may end up with some of the chocolate liquid at the end. Either eat it all immediately or keep some to add on top of the tarts later for decoration. – I got about 14 tarts with the regular sized cupcake forms I used. – Be imaginative and creative! The possibilities are really endless. One can play with different ingredients, textures and flavors for the shell. And as for the fillings- go crazy. Add a bit of liqueur, chili or any other spices, use other kinds of chocolate, use nuts, dried fruits, preserves. Also, if you can be very creative with toppings and decorations. I would say you can do whatever you like, as long as you make a sweet tart in a similar format. Have fun! Entries should be in by March 2nd. The roundup will be posted by the 7th (same day we are flying out!) and the winner will be announced the next week from somewhere in northern Vietnam. The winner will receive a gift from me, perhaps I will pick up something fun in Hanoi? The host will select, make and post the original Donna Hay recipe without any changes. Participants may make the same recipe as is, or put their own spin on the recipe by altering the ingredients whilst remaining with the theme. Entrants must include a link to the host in their post. They look fabulous and sound so easy as all of Donna’s recipes are. I can’t see the email address for the entries. Thanks for hosting and good luck. They look amazing..and oh so yummy! Will get my thinking cap on! This look mouth watering,would like to pass it on to my wife for a quick fix. Thank for a great job. I am so jealous of your trip to Vietnam! I grew up eating a lot of pho bo and can’t get it here. I make it, but it’s just not the same. Eat a bowl of pho for me! Barbara, Bron en Joey- cannot wait to see the entries, real excited to see what’s going to come out of your kitchens! Benowete- these are so easy, why not fix them for your wife as a surprise? Erin- I’m looking forward to the food and cooler climes for a change. Will have two bowls of pho bo for you! Where do you find the time? You’re like a SA/Thai male clone of Martha Stewart that is making the rest of us look bad! Those look delicious! These look like decadent macaroons with even more chocolate – something in my opinion you can never get enough of. I’ll have to see what I can come up with. Thanks for this fabulous recipe!! 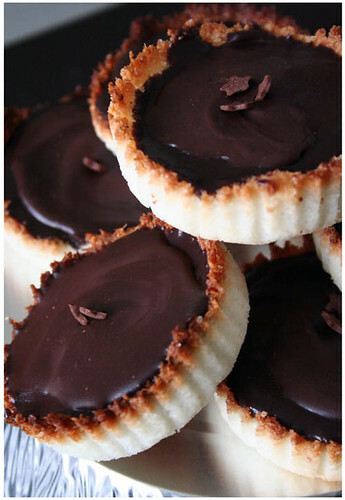 Will make these Tarts tonight and send you my pics! hey! did you get my mail?!?! thanks again for the amazing recipe! 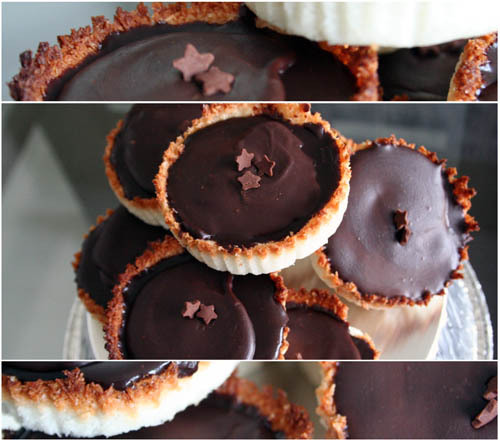 Those look just delicious – I love the little stars, I love the coconut crust, I love the chocolate centre, mmmm…. I’m just playing around with chocolate and coconut at the moment and this seems just perfect. Thanks! I am so sad I missed this contest! Does anyone know who is hosting next?